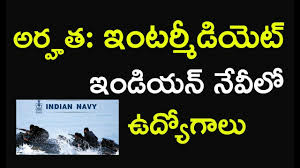 Indian Navy Applications are invited from UNMARRIED MALE CANDIDATES (fulfilling the conditions of nationality as laid down by the Govt. of India) to join the prestigious Indian Naval Academy, Ezhimala, Kerala for a four year degree course under the 10+2 (B Tech) Cadet Entry Scheme. Eligibility : Passed Senior Secondary Examination (10+2 Pattern) or its equivalent examinations from any Board recognized by Council of Boards of School Education in India (COBSE) with at least 70% aggregate marks in Physics, Chemistry and Mathematics (PCM-Passing in each subject mandatory) and at least 50% marks in English (either in Class X or Class XII). Age. : Born between 01st January 2000 and 01st Jul 2002 (both dates inclusive). Selection Process : Shortlisted candidates will be informed about their selection for SSB interview. SSB interview will be conducted in two stages. Stage I test consists of Intelligence test, Picture Perception test and Group Discussion. Candidates who fail to qualify in Stage I will be routed back on the same day. Stage II test comprises Psychological testing, Group testing and Interview which will last for 04 days.